The Lampung District in Sumatra is home to the most celebrated textile tradition of the Indonesian Archipelago. This is an area known at its core for ancient Austronesian megaliths, Bronze Age decorative influences, and the great cultural impulse of the Buddhist/Hindu state of Srivijaya. A millennium ago, there also washed upon its shores a cosmopolitan world of ideas and trade goods from China, India, Arabia, and Europe in exchange for prized Lampung pepper. From this we witness a cultural and aesthetic hybridization at its most fertile, both esoteric and compellingly beautiful, but not widely understood. This lecture will shed some light on this topic through an examination of the ritual cloth of the area. 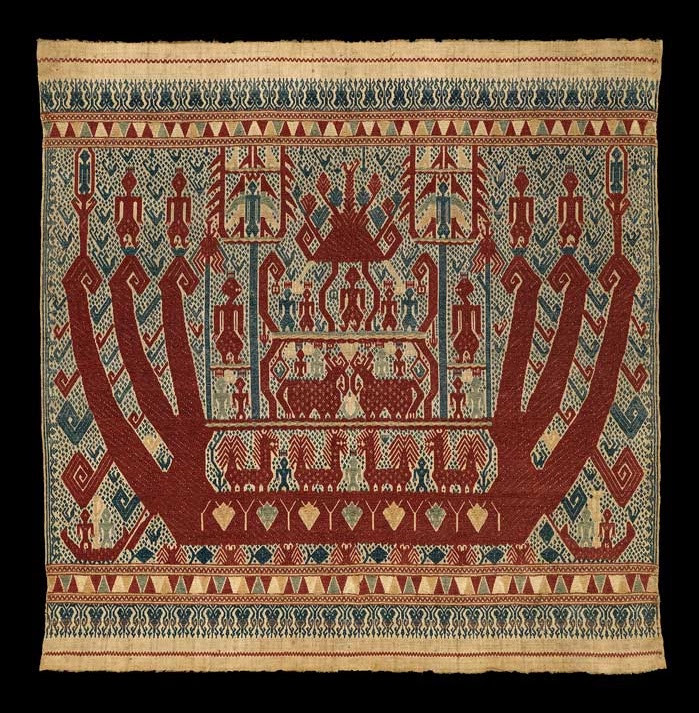 It will review all of the major weaving and dyeing artistic expressions, including the famed supplementary weft palepai and tampan ship cloths; initiation sarongs, with their richly embroidered boat and ancestor iconography; tapis; lampit mats patterned by burning; and the mysterious weft ikat bidak ritual cloths, with their small bird and deer motifs. The speaker will present original research, demonstrating some very early dating of certain special cloths and insights gained from radiocarbon testing. Lampung textiles will be contextualized as part of a greater Southeast Asian textile heritage, including comparative woven structures and iconography from the mainland, Borneo, and some of the outer islands of Indonesia.